For the first time since March, nobody wore shorts on Sunday. From left to right: Doug, Tim, Gary, Mike A., Hacker (real name). Turnout was low last Sunday. The weather was cold and windy—so much so that everyone wore long pants, even though the Sunday Morning Group gives an extra handicap stroke to anyone who wears shorts after November 1 (and two extra strokes after December 1). Also, probably, some guys were still recovering from overexposure to their in-laws during Thanksgiving week. This is the thing I got in Norway. 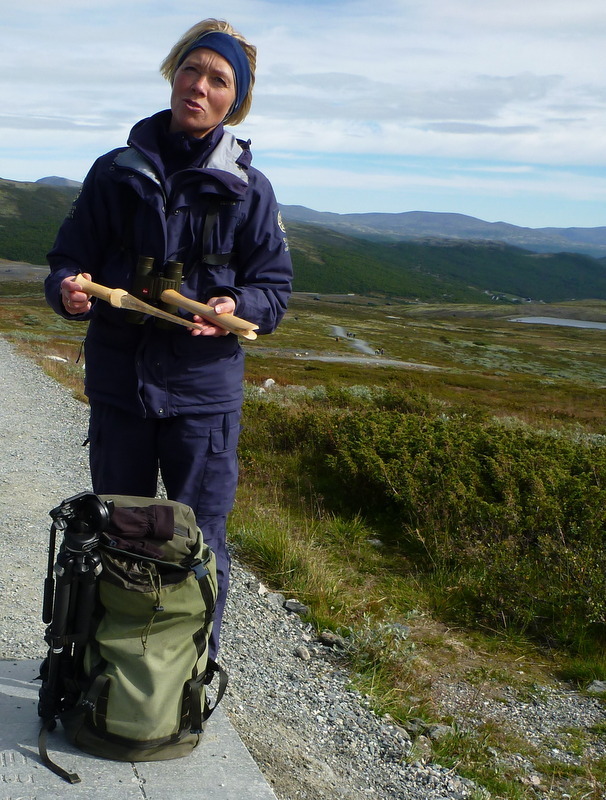 A guide in a Norwegian national park. 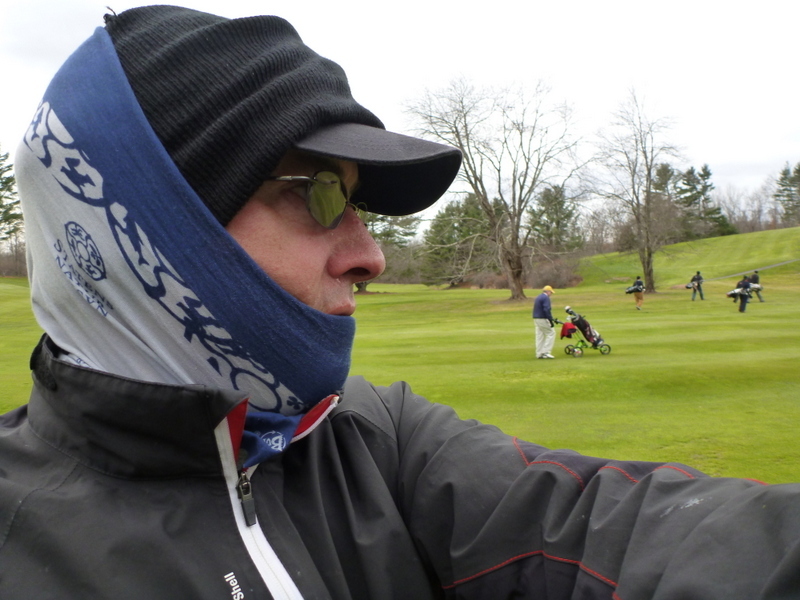 I realize that this looks ridiculous, but it was very warm, and it kept my Enniscrone Golf Club stocking cap from popping off the top of my head. Is the Norwegian thing a snood? I can’t say, because I don’t really know what a snood is, and the dictionary and Google aren’t entirely helpful. Many years ago, a woman on a street in Cambridge, Massachusetts, asked my wife’s grandmother, “Where do you buy your snoods?” and my wife’s grandmother didn’t know how to answer because, even way back then, she didn’t really know what a snood was. (It turned out that the woman was referring to her headband, which my wife’s grandmother had bought at Woolworth’s.) 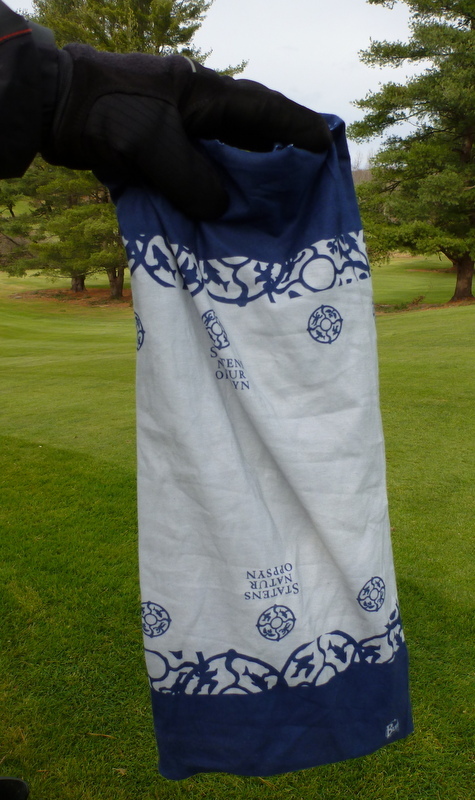 Anyway, I now keep my Norwegian thing in my golf bag, in the same pocket as my winter gloves. It weighs almost nothing, but in cold weather it’s an emergency head heater. This entry was posted in Accessories, Hacker (real name), Ireland, Sunday Morning Group, Weather and tagged Enniscrone, snood by David Owen. Bookmark the permalink. Think of it as a thermal head sarong. It looks awesomely comfortable and warm. That hickey is now sold as a “buff” – under Hats by Orvis Company for example. They became popular 5+ years ago among bonefish and tarpon fishermen because they’re a great shading device, and there’s no relief from the sun on a flats boat. 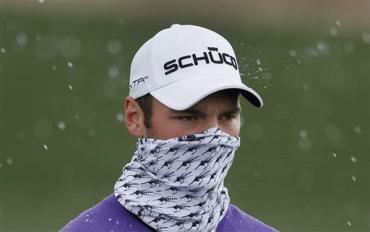 Martin Kaymer wears one occasionally. Why the golf cap and knit cap? Perhaps drop the golf cap and go with the knit cap with the Norwegian thingey to avoid the golf cap pushing up the knit cap. I’m and glad to know about “buff,” and the Martin Kaymer photo is great. As for why so many hats: even though there wasn’t much sun, I liked having a roof over my eyes. I tried everything in several combinations, including just the Norwegian thing and the golf cap, but the combo in the photo was the best in terms of warmth, shading, and stability. I have two of them, but I can’t find either of them. Santa may have to bring me a couple more. At Bandon Dunes six or seven years ago, two friends and I had what we called a five-hat day: golf cap; knit cap; golf cap plus knit cap; rain hat; rain hat plus knit cap (underneath). A “snood” is a WWII era headcovering. Best way I can describe it is comparable to a tied at back of neck bandana or babushka or even a Moslem headcovering BUT much more attractive because there was material that hung down at the back–sort of baglike–(tie was under it or even longer ties could bring around and tied at top front of head. In black, worn with earrings, could be dressy and we wore them, say, on a bad hair day OR windy day OR (like you) on a cold day–ever been in Manhattan when it’s windy and cold? Those building-lined streets are like wind tunnels! Hats won’t stay on–a snood filled the bill (with earrings). I remember wearing them there when, say, going in on a cold day for dinner or theatre. On VE day, we heard the news sometime after supper. I had already washed my hair, but of course one HAD TO HEAD TO TOWN and celebrate. I set my hair with bobby pins, got dressed up with snood over set hair, and off my sister and I went to Hempstead on long Island to join the THRONGS out there going from bar to bar. Sometime during the evening I was able to remove it, comb out my hair and continue celebrating until almost 3. You can safely call it a buff, instead of the norwegian thing :). We call it a buff in Norway as well. Scrolling down the page that blonde woman flashed by and I thought she looked very familiar, like someone I might meet in the street here in Stockholm. Turns out she is Norwegian, It figures. I would call it a buff. that is what they give the teams on the show Survivor. the combo looks perfect. I agree with the brightness and need for the visor as well.